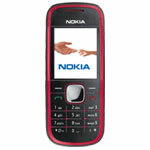 The Nokia 5030 XpressRadio phone is one of the recent releases of the popular mobile phone manufacturer. It is the first Nokia mobile phone that has its own internal FM antenna. Along with its built-in speakers, this feature allows the use of the phone’s FM radio function without requiring the use of the headsets or external speakers. The Nokia 5030 also features a one touch FM radio and channel selection function, allowing users to access their favorite sources of FM music and entertainment source faster. This XpressRadio unit is a basic phone with FM radio capabilities and is quite ideal as a mobile phone for emerging markets. This phone allows users about a day’s worth of listening time and about ten hours worth of talk time. The Nokia 5030 XpressRadio mobile phone is currently available in Europe aside from the other emerging markets where such basic phones are quite popular. Price for the phone is estimated at somewhere below 40 Euros.